Whether you want to work in government, hospitals, entertainment, nonprofits, sports, or other industries, a business minor will set you apart from the other graduates in your career field. The management and financial knowledge you gain will expand your job opportunities or help you get promoted sooner. 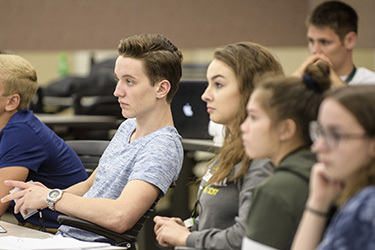 For non-business majors, this minor will only enhance the skills you learn in your major program with a foundation of valuable business skills. In this program, you will learn the basics of accounting, economics, marketing, financial management, and management and organizational behavior. No matter what industry or career path you take, you can benefit from skills and knowledge gained in the business minor program. This grounding in the basics of business will make you more attractive while internship or job searching or help advance your career further. We encourage you to apply skills learned in the classroom through experiences with local organizations. You will learn from our award-winning faculty and work on significant projects, allowing you to apply your classroom education to real-world situations. View Business Minor program requirements in the University Catalog. If you are a current student and meet these requirements, go to the WINGS Express Major/Minor change request form or talk to your advisor about adding a minor. When you complete the program, you will graduate with a minor in business. The program requires you to take four required classes in business basics, a class in financial management, and several electives of your choice.